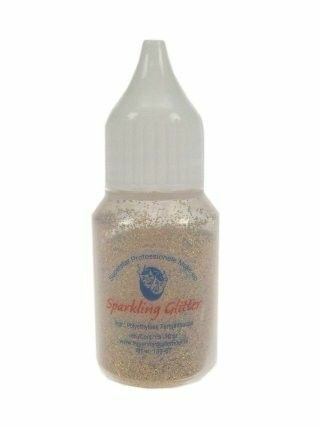 Product information "Superstar Sparkling Glitter puffer Gold"
Loose hologram glitter in a handy puff! The Sparkling Glitters have a hologram addition. That means that the glitters shine in light. It gives a beautiful shimmering effect and finishes all your make-up. The use of the puff bottle is also very simple. Have the child close his eyes and keep his head back. Puff from a distance (slightly squeezing the bottle) some glitter in the face, and the result is there. Girls love it! The glitters have a static effect, which keeps the glitters well on the face. If you want a longer lasting effect, apply the glitters when the make-up is still a little wet. Related links to "Superstar Sparkling Glitter puffer Gold"
Customer evaluation for "Superstar Sparkling Glitter puffer Gold"